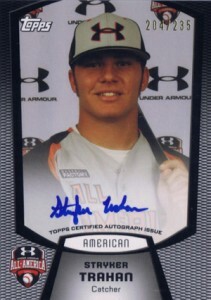 For years, AFLAC autographs have become a key component of the Bowman Draft line. While they'll likely never be as popular as the Bowman Chrome Autographs found in the product, the cards are a nice bonus. They give collectors some of a player's first autographs. 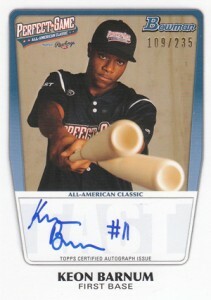 2012 Bowman Draft Picks and Prospects Baseball is no different, although concept is evolving as game sponsors change. The set has 15 autographs from the AFLAC, Perfect Game and Under Armour games. 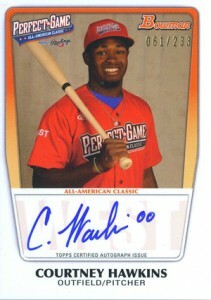 Topps produces these cards during the events, which showcase some of the nation's top high school players. After hosting a photo shoot, the cards are quickly printed and signed. Some are given to the players to trade and hand out as they like. As players get drafted and sign professional contracts, Topps inserts them into packs. 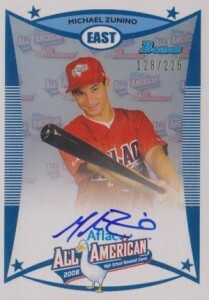 For most years, 2012 included, Topps serial numbers the pack-inserted AFLAC autographs. This helps ensure their authenticity. All cards this year are numbered similarly, between 225 and 235. When Topps didn't number the cards in 2011, there was a bit of an outcry. This led to Topps offering free PSA grading for the cards. 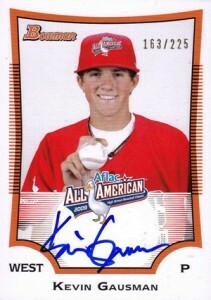 Most of the 2012 Bowman Draft AFLAC, Perfect Game and Under Armour signers also have Bowman Chrome Prospect Autographs, although there are a couple of notable exceptions. 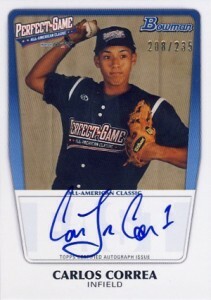 Carlos Correa, the first pick in the 2012 MLB Draft appears on a Perfect Game card. 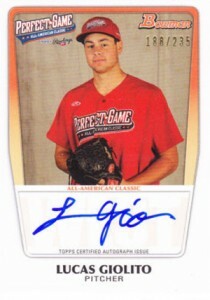 This is his first pack-inserted Topps autograph. The same is true for Byron Buxton, the second pick in the 212 draft. 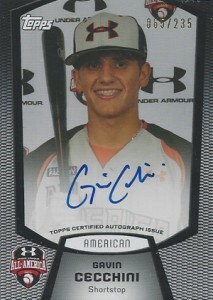 The highly regarded Twins prospect has a signed Under Armour card, but nothing else in the release. 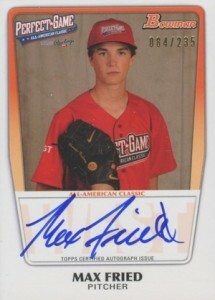 Below is a complete checklist and gallery of all the 2012 Bowman Draft AFLAC, Perfect Game and Under Armour Autographs. We've also included team info and print runs for each individual card. 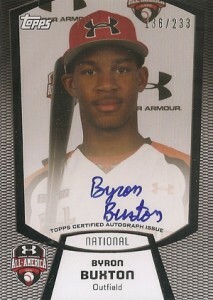 Hi, I have an unnumbered Byron Buxton, identical to the numbered one you have pictured, Bowman sent me. Any chance you know if more or less rare? Ronald Robinson � Sounds like one of the ones given out at the game. Not sure if any more or less rare (likely similar), but pretty cool given background. You may want to have it authenticated by PSA as non-numbered AFLACs have been grounds for counterfeiting in the past.